We had a GREAT winter! Of course it didn't start off so well with the death of our faithful traveling companion, Whiskey. That was definitely not a highlight. But the rest of the winter went according to plan. The weather was pretty much perfect. We had FIVE days in a row of clouds and rain back in October when the outskirts Hurricane Jova passed through the hills of Jalisco. But then we had almost four solid months of blue skies and sunshine! I don't ever get tired of beautiful perfect weather. Some people say they miss the four seasons, and I guess that's a good thing because it would get awfully crowded down here if everyone thought like us! How can you get tired of blue skies and sunshine? However we do get tired of the beach. Many people come to Mexico specifically for the beach, but after a couple of weeks we get tired of the salt spray and sand fleas that are common at many Pacific coast beaches. Plus, there is sooo much more to see inland. And we took advantage of that by visiting Uruapan, Patzcuaro, Cuernavaca, and Mexico City for the first time this past season. Ruth came across a picture of a neat building in Dresden, Germany. We would like to visit this place this summer! 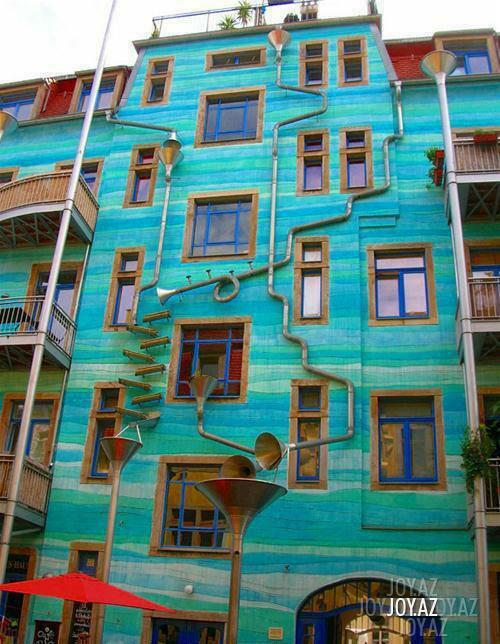 When it rains, the building plays music! might get annoying if you lived there, but it's pretty cool! The campground is emptying out and people are heading north. There are only two other RV's here besides ourselves and one of them is leaving this morning. We would take a drive down to the beach from time to time for a walk on a Sunday afternoon when we lived in Puerto Rico, but we're definitely not "Beach People". And yes, later in the day you'd get eaten alive by either sand fleas or those little annoying flies. We had our own pool so, the beach? Meh. We only "missed the seasons" when we realised just how confused we had become about when certain events would take place. Every day was the same, weather wise, so we'd have to make sure and write things on the calendar. Mind you, as the years have rolled by, we've begun the realise that phenomenon is called "getting old", so maybe the lack of seasons had little to do with it! Like you said the beach is great, but like you we can a bit, then enjoy many other things too. not a water person....love looking at the beaches in your photos....that's enough for me. that building in germany looks very interesting. p.s. voted...sam voting from home and me from here. thought I could vote w/ my home email too, but apparently they could by the ip address. Tie your wallabee down, mate! That building in Germany is so cool. Your right...it might get annoying with a lot of rain. We have been with you the entire trip in MX, and it has been a good one! Thanks for taking us along. Enjoy your week. It's been a fun time reading all your journeys through you blogs. And if you win, reading about Australia will be very interesting!